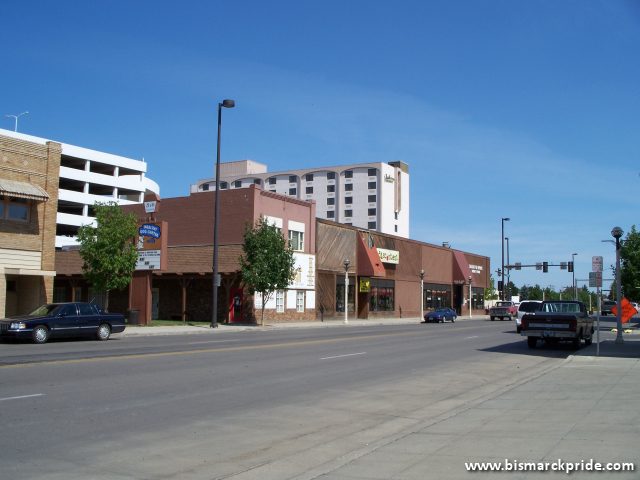 Looking northeast from the corner of Main Avenue & 5th Street in Downtown Bismarck, North Dakota. The tall building in the center background is the Radisson Inn – originally the Sheraton Galleria Hotel, and later Holiday Inn. The brown building in the foreground – today home to Seeds of Hope – formerly housed Universal Motors (later McCarney Ford). In 1964, it was converted to become a second J.C. Penney location (in addition to the NW corner of 5th & Broadway). The location emphasized auto service, appliances, and hardware merchandise. Penney’s consolidated its two store into Kirkwood Mall in 1980 as part of the mall’s Phase II expansion. The green space has since been filled in for Luft Bar. The tall white structure in the left-background is the Parkade Ramp. See a timeline of J.C. Penney’s local history. The current home of the Bismarck Tribune, who’s first edition was in July 1873.